Ending up three weeks of vacation and I have to say I am not ready to go back to work on Monday , although I guess my soul has been cleansed enough I can make it for another year. After getting back from my trip I spent a few days at the cabin and Apache is proving to have good natural ability. I couldn't be happier with him, although retrieving is a work in progress. Here's a picture of him with his first bird, the other one was an assist from Jack He sat for the picture so no one can laugh at his bushy tail and Scruffy aka Jack didn't want to be in the picture. Had a great time in CO. Did a lot of hunting in the Craig area. I had my eye on some real nice bucks but the shot opportunity never presented itself, so on the last half hour of the last day I took a little guy. If it wasn't so much more expensive to live there I would be there in a heartbeat. Attempt at a slideshow of CO.
Last edited by Jacksbuddy on Fri Nov 14, 2008 3:16 pm, edited 1 time in total. Now I'm SUPER jealous!!! Great picture! Way to go, Apache I guess spending two weeks smelling the birds that my gang got helped out. I think he's looking over his shoulder, expecting Storm to run over to guard the bird and growl at trespassers. I couldn't be happier with him, although retrieving is a work in progress. I should've just cut that darn thing and been done with it. Jack, Henley, and Apache are welcomed over anytime for a free grooming. Just not all on the same day. I guess today is my day for hunting updates from our pups. Here is the email I got from the guy who got our Montana, now Roxy. He's been working her on pigeons since she was 3 months old and seems to be a great dog for him. Well all of the hard work and effort have paid off tremendous so far. Since October started and th game farm opened we have killed 60 birds over Roxy and Toby. Max (roxy's bro) has been exposed to birds, while he is catching on he just doesnt seem to have the drive that she does. ( I may be partial for some reason). When she hits a point she doesnot bust the bird. She stays steady to flush, then its off to the races. If she out runs the other dogs its her bird. She has been a joy to train and hunt over. I hunt with a fella who is in his 60's and has seen many dogs and he keeps telling me that this is a pup of a life time. 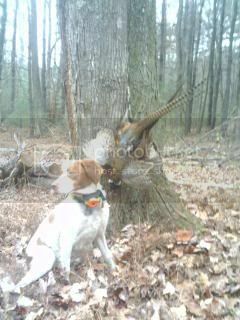 Not many dogs are like her at this age, she points, honors and retrives like a machine. I was on a week long trip in PA (Tioga) and we killed 102 birds out of 112. I only hunted her half a day because she is still a pup. Attached are some of the pics from some of our hunting trips. You can post them on the site that you use. Max is our pup Rebel. He belongs to a friend of Roxy's owner, and they get to play with each other frequently. Here's a link to the pictures he sent along with the email. ImageShack currently hates me and won't let me upload pictures without getting error messages. So it's back to SnapFish. Karen_P wrote: 3 weeks vacation??? Well 25 years with the same company, and thats all I got. I could spend another 25 and that will still be all I get . Since Brian is getting to be such a great retriever, can I borrow him? Jacksbuddy wrote: ..Since Brian is getting to be such a great retriever, can I borrow him? Can't believe Timber's and Apache's litter is almost 11 yrs-old now. Time passes too quickly.